After a couple of false starts and setbacks, here are the core foot troops for Wars of the Roses games. Intending to use Lion Rampant as the set of rules, there are 10 Foot Yeomen units (12 figures each). These can be used as separate bow and spear units, or they can be combined in Mixed weapons units. There are also 6 units of Foot Men at Arms (6 figures each); one more unit of Foot Men at Arms will be added using the free metal command figures that came with the Army deal. Note the banners on brass rods on either side of the front ranks - these can replace the ones held as the standard bearer hands have been drilled out. The delays mentioned above included my failed attempt at adding Citadel Six livery badge "decals" - and the non-arrival of Dom's Decals (which he kindly refunded my payment for). Also, part of the delay was the basing and re-basing of the figures themselves. This was due to me using a handful of existing 40mm Litko bases I had and then what I thought were more 40mm bases which I had ordered. It was only after basing the figures (using acrylic caulking) and painting the bases that I found out the new bases were actually 1.5 inch bases. Ken apologized for the mix up and quickly sent out the correctly sized 40mm bases. As far as not using livery badges, I think this actually works out better, as the figures can be used for different retinues more easily. For instance, the blue and white livery was used by many families, both York and Lancaster. To identify units, the flags supplied with the kits can be switched out as the hands of the standard bearers were drilled out. The flags themselves are attached to brass rods. Yorkist troops; the banners of Lord Fauconberg, Edward IV and the Earl of Warwick with Foot Men at Arms in the foreground. 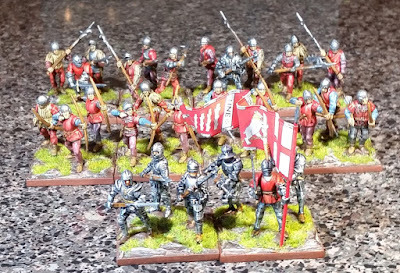 These red liveried troops can be used for the Earl of Warwick (currently represented by the large standard), or the Earl of Oxford. For the First St Albans game they will be with Warwick; for the Bosworth game, they will switch to Oxford's. 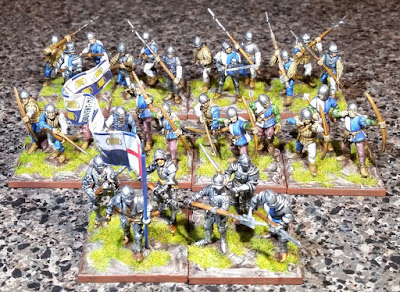 Henry Beaufort's standard lead these troops for now, but for the St Albans game they will be Henry VI's soldiers, and for the Bosworth game they will belong to the Stanleys. The white and green livery is mostly associated with Henry Tudor, who was not even born when the Battle of First St Albans was fought. 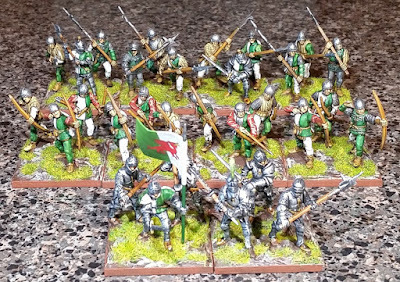 However, these troops will be used for that game, as well as for Bosworth, of course. The remaining figures for this project in my possession are the 6 metal command figures, a box each of Mounted Men at Arms and Light Cavalry, and a cannon and crew (also included as a freebie with the Army deal). The Light Cavalry and cannon will be used for the Bosworth game. In fact, I may even get a box of European Mercenaries for the Bosworth game too. Heck, I still have an almost full can of Minwax stain. Until my next post, best wishes to you all! They do look great Dean! In spite of the delays you still were quick in getting these done! Thank you very much, Rodger. Just amazing Dean, bravo Sir. An impressive array mate, and knocked out at breakneck speed too! Gosh you've knocked these out fast, delays or no delays! They look great and I think your better off without the badges so you can change a flag and have a different retinue. Fantastic retinues Dean! I'm amazed at how quickly you painted them all, great work. Spectacular results, Dean, and accomplished so quickly. Well Done! As for the mix up with Litko 40mm vs 1.5 inches squares, I have made the mistake myself with no fault on Litko mislabeling. I must always measure the base BEFORE diving into basing. Oh, really amazing work Dean! Wow, impressive and fantastic job Dean! Congratulations on completing! The figures are painted superb! Tremendous work! Great work there - being able to swap out the flags is a good idea for Wars of the Roses games. P.S. Looking forward to seeing updates to your fabulous Henry VII in France game. Nice work Dean. Lots of miniatures and they look super. Well done sir! All set backs included, at least you are able to get some hobby time in. Real life keeps messing with my schedule, but your my inspiration! Keep on trucking Dean, looking good! Excellent! You do not predict where there is an adaptation of the Lion Rampant for the bases? Thank you! My question was about something else. "Use casualty markers" is understandable. 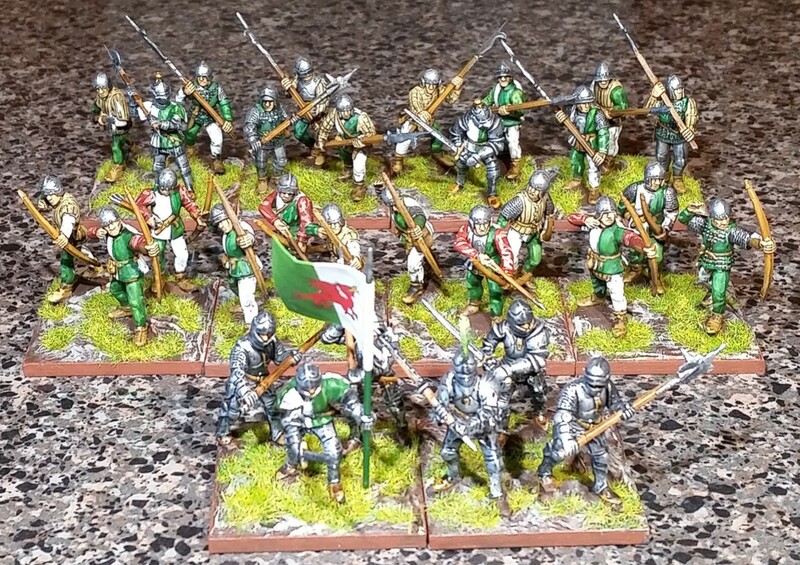 But in Lion Rampant the units consist of 6 or 12 figures. Do you use 6 to 12 bases? How then can we count the casualties? And what additions to the rules do you use for playing with bases?